This year I went to EB Expo 2013. It was my first time going to a gaming expo. 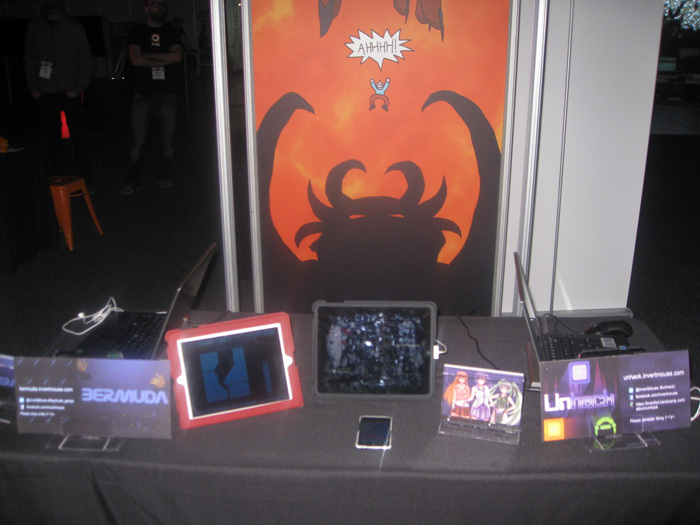 Not only that, I also had a booth there showing off my first iOS game Eternal Pain. I had a shared booth with Invertmouse and so glad to have a friend along for the ride. I doubt I could have done it myself. Overall, a very positive experience and glad I did it. It felt like being a shopkeeper for 3 days. You stand next to your stand and talk to people walking by about your wares. It was quite fun :) I’m used to just staring at a computer all day so doing this was very refreshing. My mouth was dry from talking so much. The rest of the area is dedicated to the big games that most people go to the expo for. For me, I was really not interested in checking them out. Yes, I was worried about if someone important came along, but it was more fun being at my booth and most of the games weren’t on any platforms I had ( but to be honest, I just wasn’t all that excited for them – I’m more of an indie game anyway). There were people from Gamespot AU and Good Game but none that I knew came along to the Indie Area. Maybe they were busy with their own work. Maybe what we had just wasn’t good enough… To be fair, if all you had to do was pay for a booth and you’d get an interview with the media, booths would be selling like hot cakes. There were “indie media” people and they made us feel special :). I honestly saw no change. Which is surprising but I’m ok with that. That was a main goal of going to the expo, but hey all you can do is keep trying. Not many people trying the game gave much constructive feedback but I did notice a lot of things as I was telling people about the game and watching them play. Just by going there I rose my standards and found many ways to improve the game, and that to me is awesome. Would I do it again? Without the price tag: definitely.